By the late 1970s, the Swiss watchmaking industry was facing extinction, undergoing the biggest crisis it had ever witnessed. Not only had Switzerland completely lost the low-end of the market, but the high-end also faced new and fierce competition from Asian (especially Japanese) luxury brands such as Seiko and Citizen. The Swiss watchmaking industry looked to be a piece of history. But in 1983, a Swiss company entered the mass-market for watches and turned things around for the country's storied watchmaking industry. It was able to do this by fully automating assembly, and reducing the number of parts by half (from the usual of about 100 [or more] to only about 50 components). This was a radical move because Switzerland was (at the time) known for luxury watches which retailed for thousands (or even hundreds of thousands) of dollars, whereas most watches for the mass market were assembled in Asia where the cost of labor was significantly cheaper. The move was phenomenally successful – indeed, it became the most successful watch brand of all time – and the parent company, the Swatch Group, went on to become the largest and most dynamic watchmaking company in the world. The brand, in case you haven't figured it out yet was (and still is) known as Swatch. Initially, Swatches were plastic, and came in wide variety of colors and designs. They were known for their colorful plastic bands to complement the actual watch. In fact, the company quickly partnered with artists such as Keith Haring for early designs. The brand quickly became popular among teenagers, and there were trendy things like "Swatchguards" which were rubber straps that were designed to protect the crystal from scratches. In effect, Swatch pinned its success not by accuracy or time precision, but by turning watches into a fashion accessory, in effect pushing sales by having the same consumers buy multiple versions. Indeed, many teenagers wore several Swatches as a fashion statement. Hip Hop artists (and their followers) also took to the brand, hence it expanded to a fairly wide and diverse demographic profile. My first Swatch. It's worth ~$1,600 today! 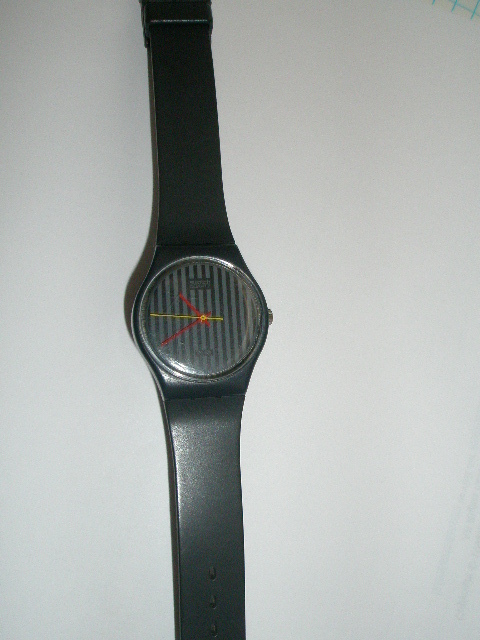 I'll admit it: I was one of the first people in my high school to actually own a Swatch. I had one hot off the assembly line, so-to-speak (well, not really, but certainly when my local Macy's started carrying them, and this was before the Macy's brand conquered the department store landscape gobbling up brands including Marshall Field's, Bon Marche, Strawbridge's, Filene's and countless others, as I lived in the NYC suburbs [exurbs?] when growing up). Anyway, my first Swatch was a grey/black color, with a watch face that was grey and lighter grey vertical stripes, and had two different colored hands for the hour and second. Nothing too radical in terms of design, but it was radical in that it was a real Swiss watch. I happened to find one of the very same design on eBay a recently. Guess what? The sale price for that was an amazing $1,600! I paid like $30 for that watch back in 1984 or so. If I had only saved the dam thing!! If I only knew! 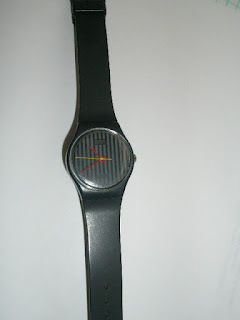 The Swatch brand also expanded beyond cheap plastic designs to include higher-end designs with metal bands, for example. 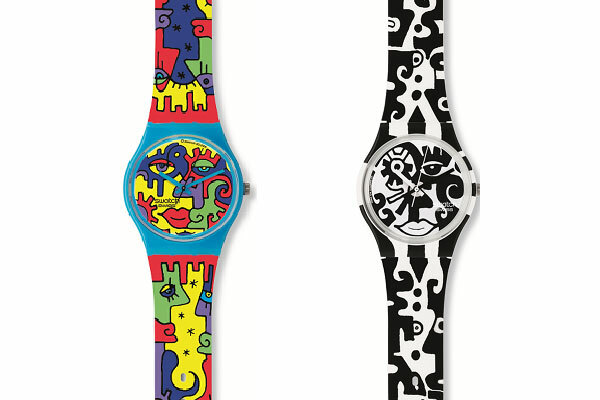 Today, Swatch remains a widely-available watch brand. While it may not have the same cachet it had in the early 1980s, they remain attractively-designed watches at prices that are decent relative to a cheap imports from China, and many are likely to be better quality (Chinese imports have not yet captured the same quality standards as Japanese and Korean-made goods have). 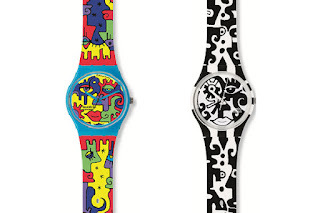 One of Swatch's early U.S. TV commercials can be seen on Retro Junk's website. See the video by visiting http://www.retrojunk.com/commercial/show/12644/swatch-watch.